The rhythm of the countryside. We had invited some friends, Caroline and Yves, and neighbours, Paul and Christiane, around for dinner tonight. Yves is a dairy farmer and Paul raises pigs; both grow crops as well. Firstly, an apologetic Christiane cycled up to cancel as Paul was working non-stop on the harvest and storms were forecast. So muggy was it, I lay awake for much of last night and could hear the rumble of the combine harvester in the distance and the constant to and fro of Paul’s tractor and trailer well into the early hours of the morning. And then Yves cancelled for the same reason. His problems were compounded as, just when the test batch had been checked for being dry enough, the clutch went on the contractor’s combine. They worked through the night to replace the part, only to discover it was the wrong one and so followed a desperate return trip to Paris to collect the correct part, all the time with bad weather forecast. As I type this, the threatening storm clouds have passed and, with luck, he should get the harvest done tonight. Only the onset of dew in the morning will stop work, as to pay to have the grain dried almost makes it not worth the effort to harvest it. So how is this relevant to our permaculture blog? We’re discovering that the countryside doesn’t conform to the calendar and diaries, but to other rhythms, like the weather. We can also see how hard the farmers work here and with slim margins. With our own small scale of production, it is viable to go and collect snails by torchlight each night, and to pick Colorado beetles off our neighbours potatoes (a little favour whilst they’re away for a couple of days) but these options aren’t available on farm scale production that puts the cheap food on supermarket shelves that nearly everyone seems to expect. The risk of rain tonight, relative to the wheat harvest, has affected us directly. Our mayor (of our commune of just 206 people) has kept his small baler in addition to the one that produces those huge round bales that are more commonly seen on the fields nowadays. 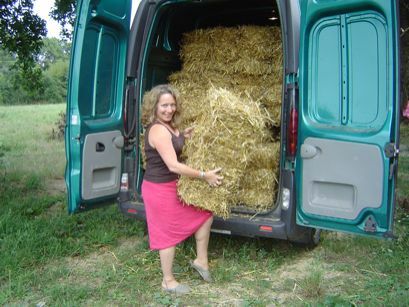 We ordered 50 from him to test the quality for our planned house build (all the books stress they should be as tightly bound as possible) to try out a few techniques and also because we need straw for the chicken and goose houses and the small bales are easier for both of us to handle. He turned up without warning this evening, at the end of a hot and tiring day for both of us, to tell us that he had prepared the small bales and did we want to collect them as rain was forecast overnight. All now done, and I’ll sleep well tonight. We hope Yves gets his harvest done in time!